Are you looking for true Carpet Cleaning Savings in Birmingham AL? You’ve come to the right place! Save time and money by having your carpets cleaned by Heaven’s Best Carpet Cleaners of Birmingham. Heaven’s Best knows your time is valuable. So, we try to make having your carpets cleaned as pleasant an experience as possible. From the time our technicians show up until they leave, they will treat you and your home with respect and professionalism. Heaven’s Best Carpet Cleaning also has a 2 million liability policy to insure our technicians as well as your home in the event of an accident while our technicians are cleaning. We value your home and your furnishings as much as you value them. We take special care to ensure that everything we clean is done to the most stringent specifications. We go through a multi-step process when cleaning your carpets. We start with a good strong commercial vacuuming. We have the best commercial vacuum on the market and vacuuming is a key element of cleaning carpets. Next, we spray your carpets with a pre-spotter and pre-spray that starts to loosen and dissolve the dirt and grime that is in your carpet. We then apply our unique Heaven’s Best Cleaning Solution which is a combination of our carpet cleaning solution, citrus booster, and citrus deodorizer. Next, we use multiple pieces of equipment to agitate and extract the dirt and soil from your carpets. Finally we rake your carpet with a tool called the Grandi groomer to help lift the pile up so your carpet will look great. It will also smell clean, fresh and deodorized. 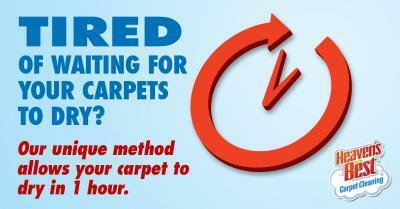 This process is a low-moisture process that uses less water than other carpet cleaners. Therefore, your carpets don’t take hours or even days to dry. It only takes 1 Hour! At Heaven's Best, we value your time. Our unique method of carpet cleaning allows your carpet to dry within 1 hour after cleaning, so you can get back to your normal life in no time. Don’t waste your time and money on carpet cleaners that will disrupt your life. If you are looking for Carpet Cleaning Savings in Birmingham AL, call Heaven’s Best of Birmingham at (205) 618-9150 for a stress-free carpet cleaning experience. You will save both time and money! Contact Heaven's Best for Carpet Cleaning Savings!